Last week, I had the opportunity to work on a styled shoot with Kim and I Love Memphis for a Memphis Fashion Week editorial. I was very hesitant to attend due to the bump. I felt as if no one really wanted to see a bump with a more fashion focused story. I mean, its not like you see many pregnant women in styled editorial stories, think about it. I did it anyway with encouragement from Kim. After the story was released, I was sent the most encouraging words from one of my Instagram friends that inspired this post, Why Working While Pregnant Is Important to me. There are nearly 4 million births in the U.S. every year. FOUR MILLION. We have to think that a majority of women carrying children are not lying on the couch all day eating ice cream and pickles. Many of them are baking children and working in a variety of different industries contributing to both the workforce and their households. Why are they invisible though? 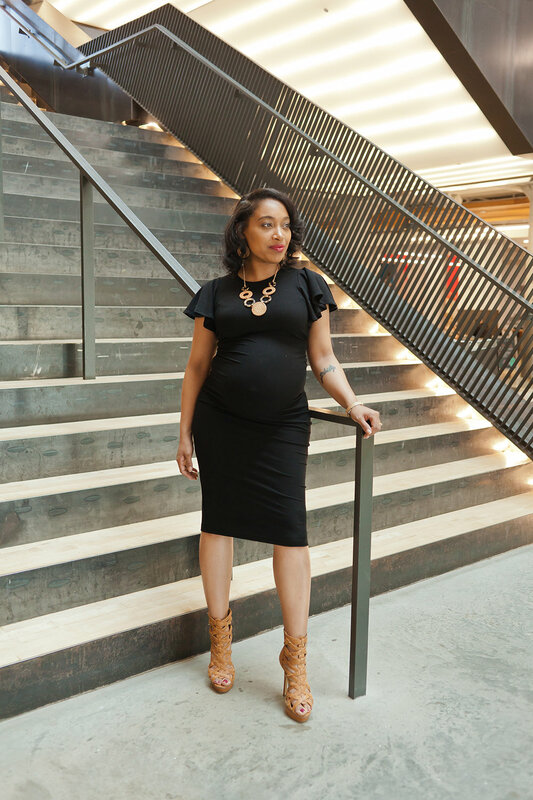 As I reflected on my own indecisiveness and insecurities of showing the watermelon bump, I knew there is a need to shift the visual narrative of women who work while pregnant, not just in corporate America but creative industries like fashion. Let’s face it, pregnancy is one of the most natural and everyday processes known to the human race. It’s how we all got here. But, why are women hiding their bumps at work even those super happy to be with child. Many women are fearful of either being mistreated, discriminated against or just feel uncomfortable with others judgements. That shouldn’t stop us though. We have an undeniable strength and power that needs to be displayed like a Picasso even while nauseated carrying little humans. I got out of my own way thinking what someone else doesn’t want to see. I joined the other women on this fashion shoot and proudly posed with my pregnancy belly. I am happy to be carrying a little boy and doing what I love with him in tow. It gives me encouragement, power, and new sources of creativity and inspiration. Life doesn’t stop because you are pregnant. It shouldn’t. The idea of creating and nurturing a new life should motivate you to rebirth yourself as a woman and a mother. Working while pregnant is so important to me. One, I have to continue to contribute to my household financially. We have some grand dreams as a family. I need to grab all of my coins. Second, it’s important for me to be a role model to Amira if she chooses to be a mother one day. I want her to be empowered as a woman. She needs to know that she can balance the dynamics of work and motherhood. Lastly, I inspire myself. I look back over my days and realize that I pushed through discomfort for growth. I am showing other women with my actions not just my words that motherhood doesn’t define you. The saying goes, pictures say a thousand words. Well, it still applies to pregnancy as well. I have experienced so many memorable moments both personally and professionally during this pregnancy. Every single day since conception, I have woken up with an opportunity to work a business in which I created. I am building a company daily that inspires women to live out their dreams with their kids as well. And, I make it a point to do it with beauty and grace. I’d love to see America normalize the visual narrative of the millions of women waking up every single day showing up honey to WORK. I wish for mothers just like me to stop playing into industries and the psyche of those who think we should hide our bumps. We deserve to live our best lives whether at work or at home- because we birth a nation, sis. Thank you so much Nappy Rutz for sending the thoughtful message on Instagram . You inspired this post as well as my spirit to keep moving as a mommy.